Serving alcohol at a baby shower can be a delicate matter. Approval from the mommy-to-be is a must, and if she would prefer to forgo the booze, think about crafting one of these. BUT, if Momma is down, then go for it! Your primary concern is going to be keeping it classy. Nothing ruins the baby shower vibe like bottles upon bottles of liquor, and you don’t want your guest of honor to feel like an outsider at her own shower. Keeping this in mind, I recommend a signature cocktail, served in an eye-catching vessel. 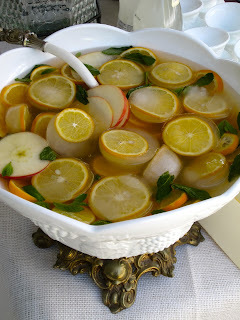 I created the following Bourbon Peach Punch for the last baby shower I hosted, and it was a hit. It was gorgeous in my mother’s vintage punch bowl, dressed up with fresh fruit and lemon-ice cubes. Make sure to select a cocktail that is not too stiff (we don’t want Grandma stumbling out the door), and choose something that complements your menu and overall aesthetic. The last thing to remember when choosing a drinks menu for a baby shower is to be sure to have equally special non-alcoholic options available. Italian sodas are a fun option, and you certainly can’t go wrong with classic iced tea or lemonade. This will allow everyone to feel that they are equally involved in the celebration, regardless of their choice to imbibe. Combine all ingredients in a punch bowl or beverage dispenser and stir. Garnish with fresh fruit, ice cubes, and mint sprigs.